1.0.1 Disclaimer: I was invited by Theater Restaurant and Schaffhauserland Tourism Board, but as always, all pictures and opinions are my own. 1.0.2 More pictures on Instagram. Follow my page on Facebook. 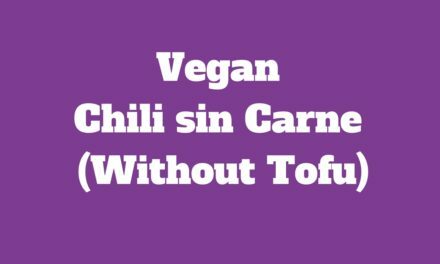 Traveling the world as a vegetarian is not always easy, but definitely not impossible. Switzerland is a bit tricky for vegetarians – and vegans. Cities like Zurich are very vegetarian-friendly and the oldest veggie restaurant in the world opened actually in Zurich. However, it is no secret the Swiss love their cheese and meat and vegan options are very rare in smaller towns/villages. 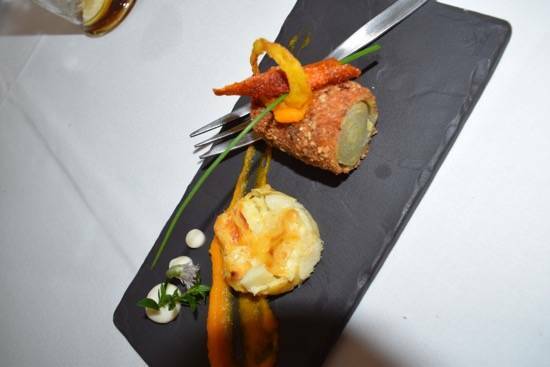 When I started my blog, I planned on blogging about my dining experiences as well. The problem is, that I love food too much. I am not the person who takes trillion of pictures and then eats cold food. 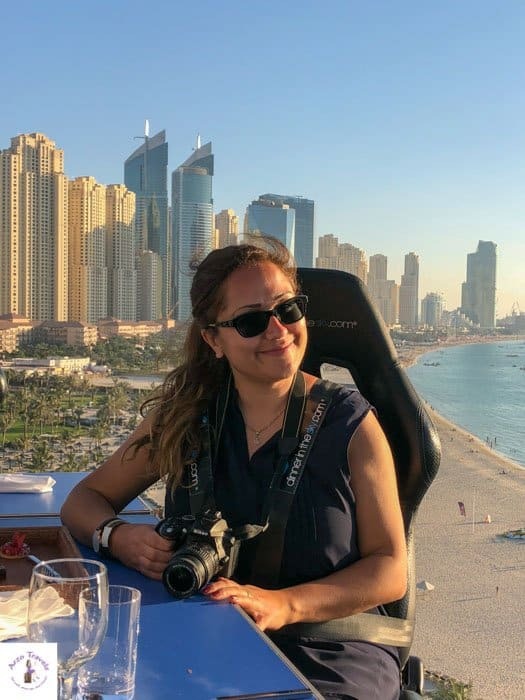 I like to eat as soon as my food is there so you will not find too many pictures but I am happy to share great vegetarian dining experiences I made during my travels. 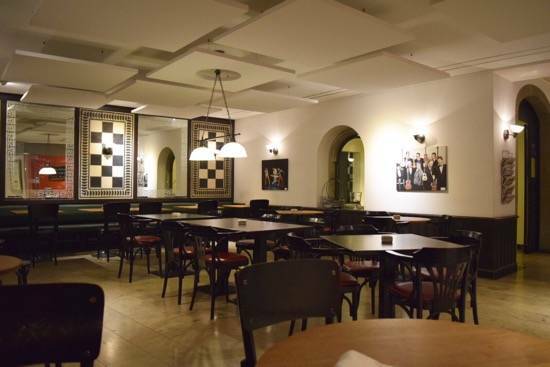 My first post about vegetarian dining is about my experiences at a restaurant called Theater Restaurant Schaffhausen (north of Switzerland, close to the German border). The funny thing is, that the first “review” is actually one of my vegetarian travel highlights (update: December 2016, even after many more restaurant reviews I still consider the dining experiences at Theater Restaurant as one of the bests so far. Who would have guessed, that I found the best vegetarian food in Schaffhausen? I would never have guessed that I have one of my gourmet highlights here in this cute town but let me start from the beginning. 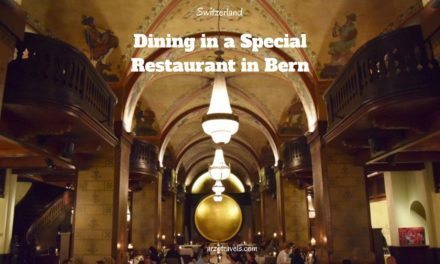 The restaurant is located in the center of Schaffhausen (mostly know for the Rhine Falls, the biggest waterfall in Europe) at the Herrenacker. It has seating options inside and outside available. When I arrived I sat outside where you have some nice views over the small town (later it started to rain so I sat inside). I came from Italy, and I arrived much later than originally planned. I was hungry, tired and starving. I am not sure in how far that influenced my senses, but I assume the food would have been great even if I had not had a long and busy day. I arrived and was welcomed by the very friendly staff. Especially the boss, a young and very friendly woman, were extremely friendly, and I loved the way they communicated with the guests. The menu is quite small but I think here it is about quality over quantity, and I found some nice vegetarian options. 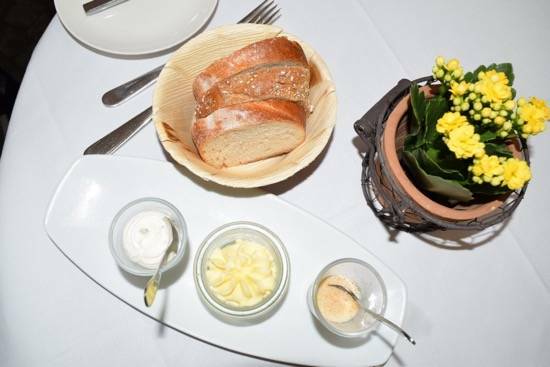 My menu started with some bread and several spreads, followed by a greeting from the kitchen. Asparagus quiche with baked chicory – the only thing I was sorry about was the size of these delicious little treats that tasted so fine I could have eaten tons of them. I admit that I was skeptical first but if you get a chance to order this treat – go for it. I continued with some Mediterranean grilled vegetables, which is never a bad choice and it did not disappoint me in this case. It was well seasoned and just tasted delicious as I expected it to taste. I was surprised, to find Indian food on the menu and so I ordered Indian dish – namely rice with a delicious curry and some vegetables. Well, this is not typically Swiss food, but more a combination of different flavors from around the world. Again, I really enjoyed the course. If food tastes like this no one will miss meat! Unfortunately, I was already so full that I only had a small dessert. I am normally a huge dessert fa, and order big portions but in this case, I tried some banana ice – which, to my surprise, was extremely delicious. I have never had banana ice-cream before, but if it always tastes like this, I am happy to order it more often. Since you can never expect a bargain in Switzerland, I think the prices are good for what you get at the Theater Restaurant. As in the beginning mentioned this menu was almost a kind of revelation. The Theater Restaurant in Schaffhausen does its reputation, being one of the best restaurants in Schaffhausen, full justice and I enjoyed not only an excellent menu I also enjoyed the atmosphere and the welcoming staff. For more about the Theater Restaurant check out the website. Disclaimer: I was invited by Theater Restaurant and Schaffhauserland Tourism Board, but as always, all pictures and opinions are my own. 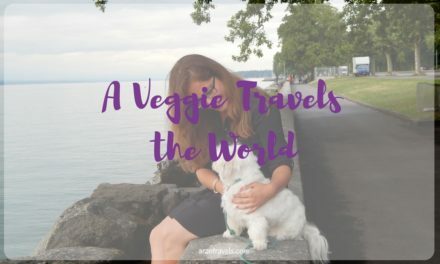 Read more about my decision to become a vegetarian here and find out about my Switzerland trip (hotel recommendations, where to go and what to do) here.